Local programs provide vital support and services, including legal advocacy, counseling, employment and job readiness services, help in overcoming financial abuse, safety planning, transportation, and childcare. Advocates provide survivors with tools to empower them to address each unique and often complex need. 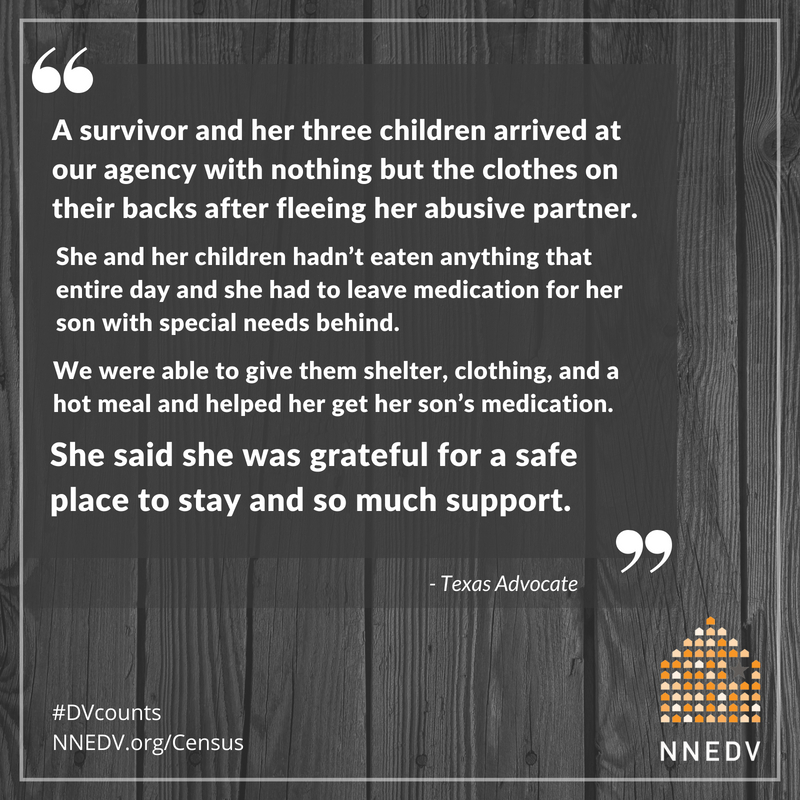 Domestic violence programs and advocates provide refuge and support to victims in need of understanding and safety. 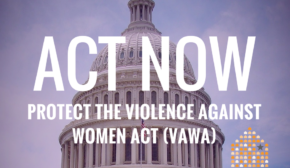 Victims often reach out for assistance after a particularly violent or threatening incident, or when the violence has escalated and they fear for their lives or the lives of their children. 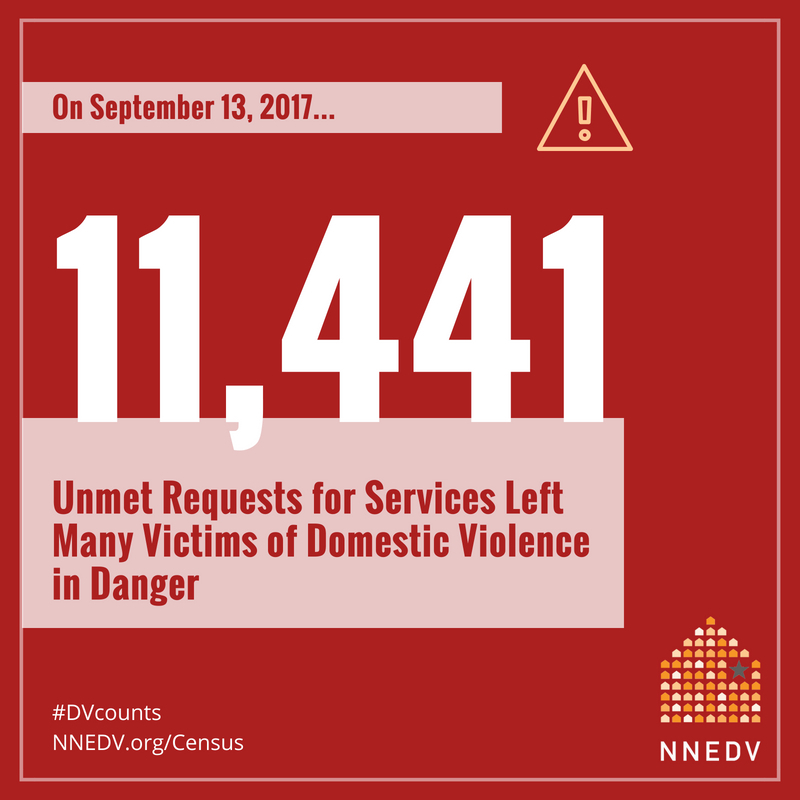 It is vitally important that domestic violence programs are equipped to provide services and safety whenever a victim reaches out for help. Survivors escaping abuse and beginning new lives have many basic needs – which may include food, transportation, childcare, legal assistance, or financial assistance – but one of the most immediate needs is a safe place to stay. 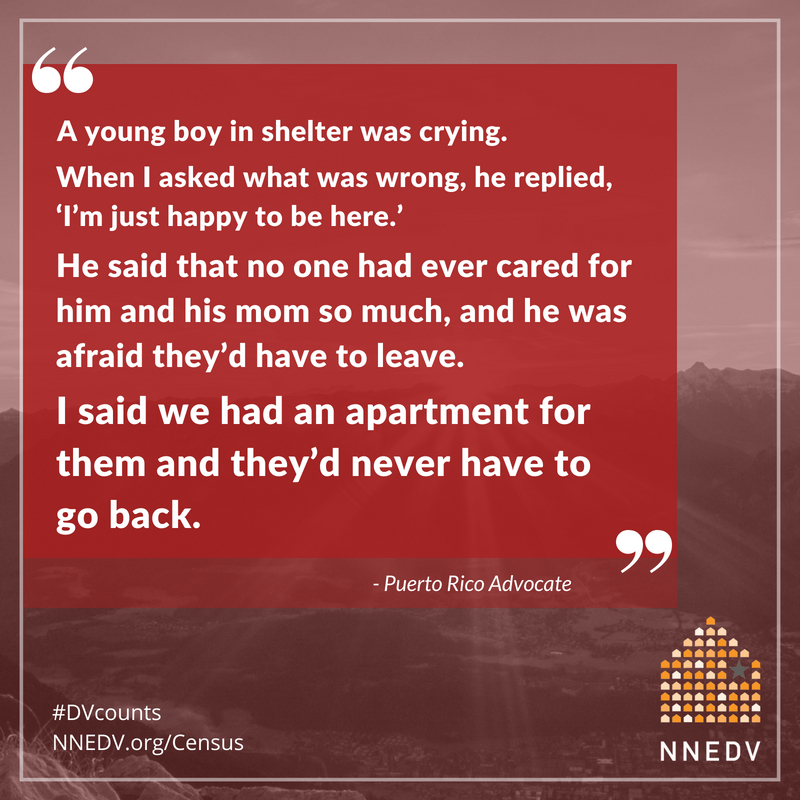 When victims make the difficult decision to leave, they should not have to worry about where they and their children will sleep at night. Through housing services, local programs provide safety and community in a time of fear and uncertainty. Following a stay in shelter, many survivors have little money and no credit and need help transitioning to permanent safe housing. Transitional housing is offered by some local programs as a temporary accommodation designed to be a stepping stone between crisis and long-term safety and economic stability. Short-term rental assistance, permanent supportive housing, or other housing options are also offered by some programs. 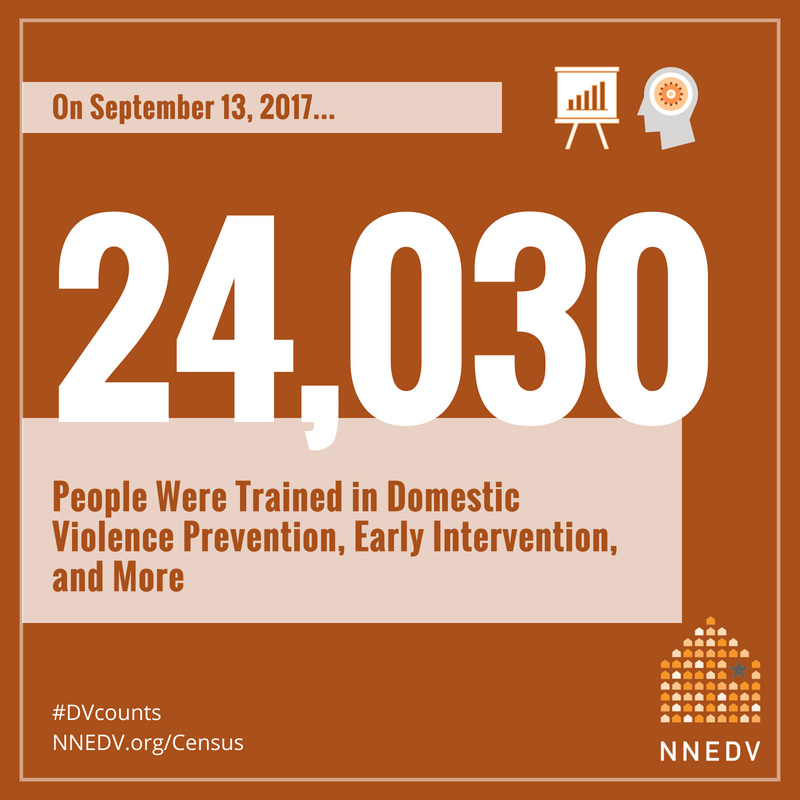 Local programs foster community-wide education and prevention initiatives that are crucial to creating a world free from domestic violence. In a single day, advocates provided 1,240 trainings that addressed domestic violence prevention, early intervention, and more. During trainings, community members, students, and professionals will sometimes reveal that they are being victimized and ask for help. 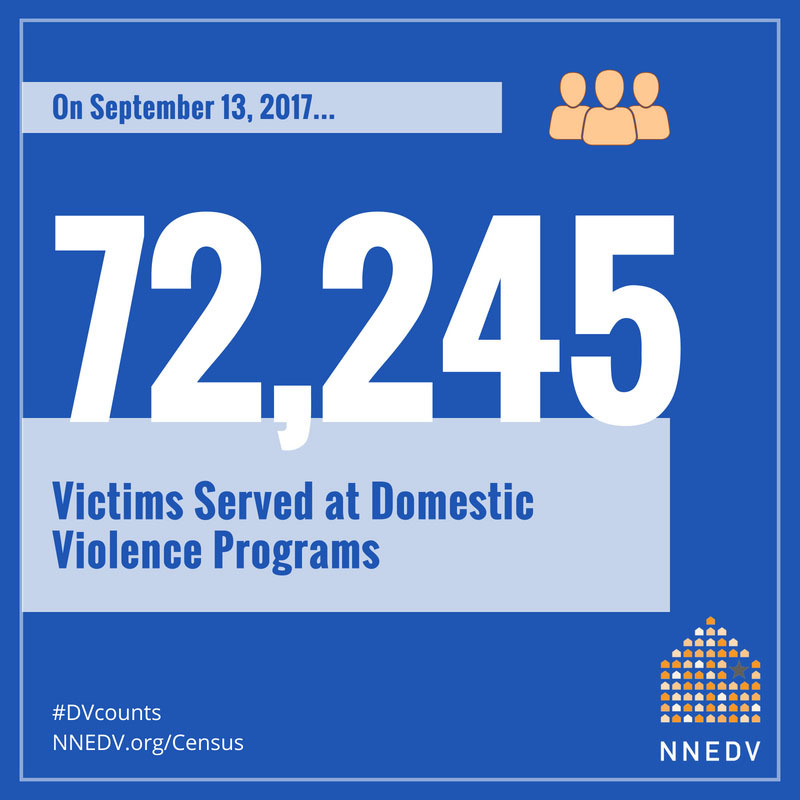 This illustrates that domestic violence can happen to anyone and demonstrates why community-wide outreach is important. Local domestic violence programs help students, educators, and parents understand the many forms of domestic violence, including financial, emotional, and technology-facilitated abuse. 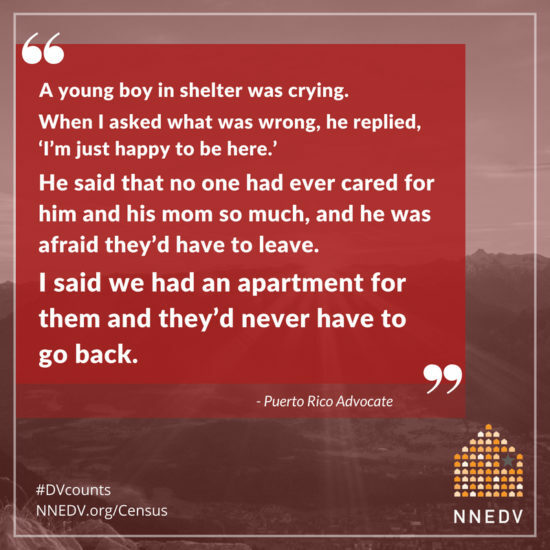 Encouraging a deeper understanding of domestic violence results in a community response that is more receptive to victims and demands greater accountability for perpetrators. Domestic violence programs and shelters across the country are operating without enough funding and staff to meet victims’ needs. 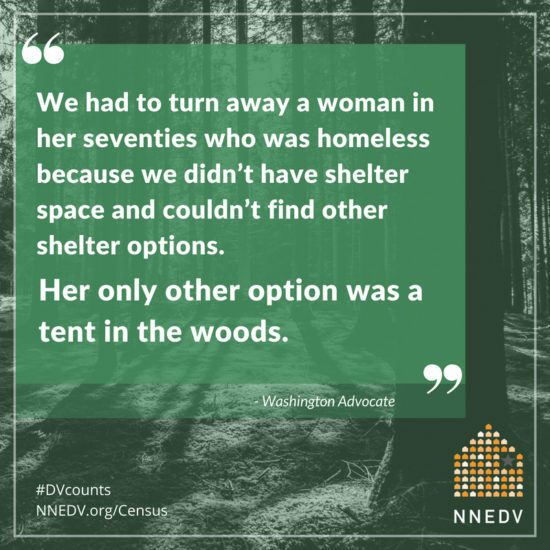 Victims made 11,441 requests for services – including emergency shelter, housing, transportation, childcare, legal representation, and more – that could not be provided because programs lacked the resources to meet victims’ needs. 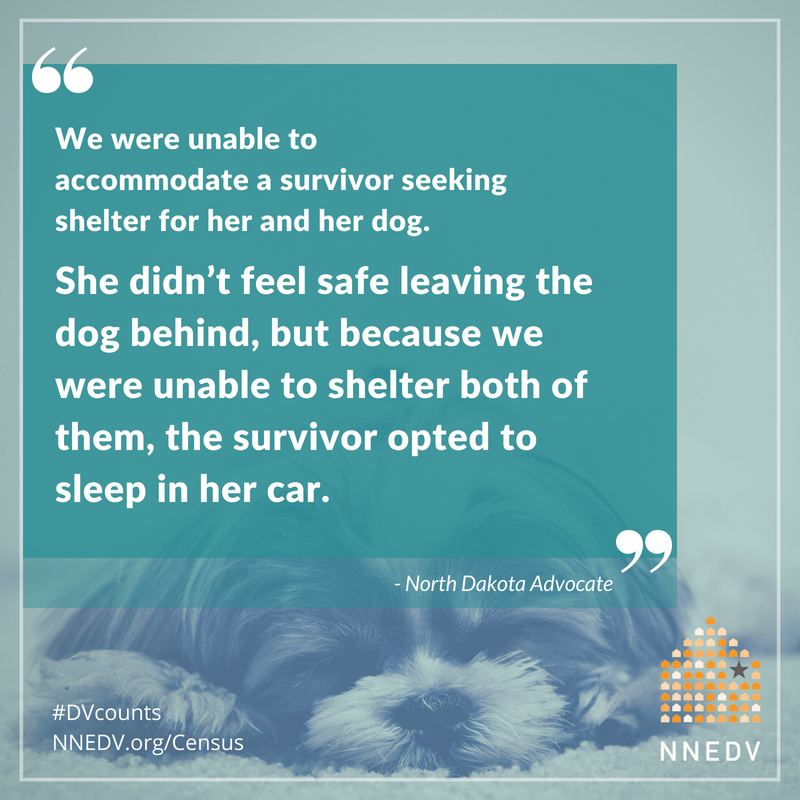 Shelter is crucial for victims facing life-threatening violence, particularly because leaving is the most dangerous time for survivors. Abusers often try to prevent victims from leaving by escalating the violence. When shelters are at capacity, many programs look to alternative safe locations to house survivors, such as hotels or motels, which can be expensive. 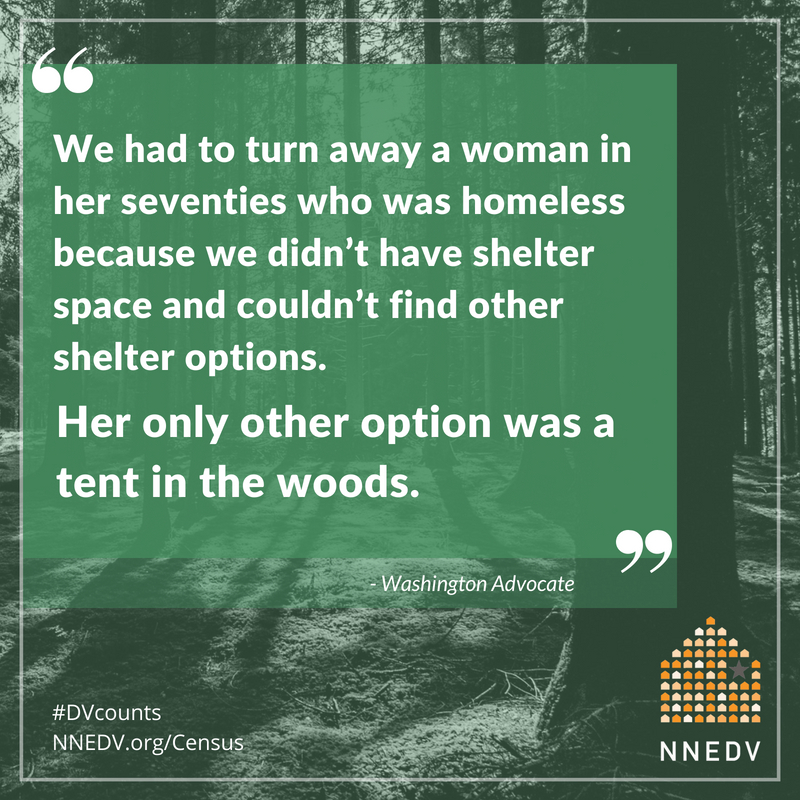 Without this option, victims and their children may be forced to choose between homelessness and returning to a violent abuser. 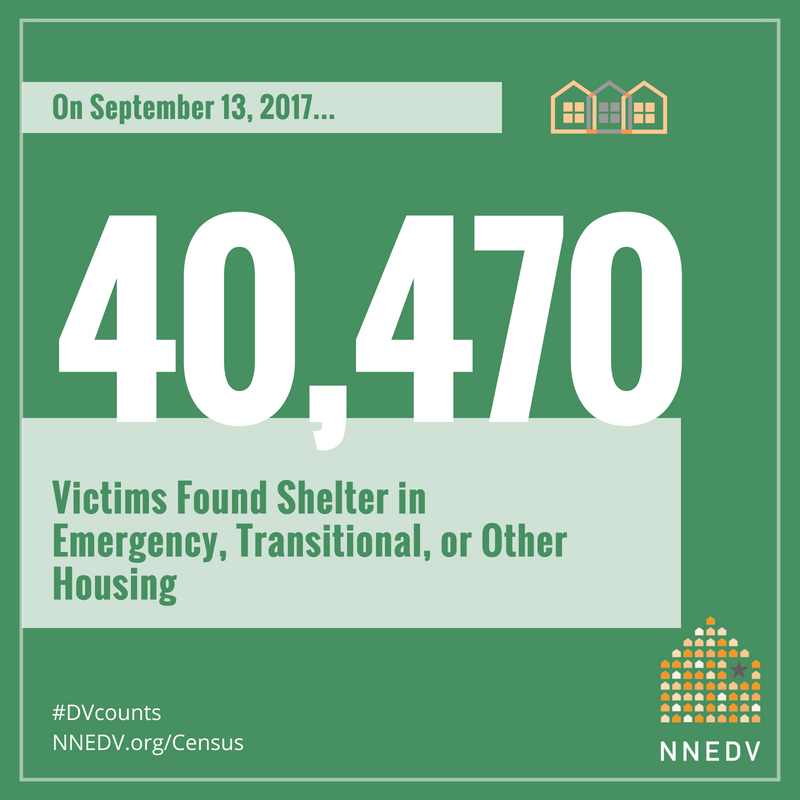 Shelters often have to evacuate many people at once, while taking into account specific safety concerns. They may have to transport survivors to shelters a significant distance away, or work with community groups to set up temporary shelters to meet survivors’ safety needs. 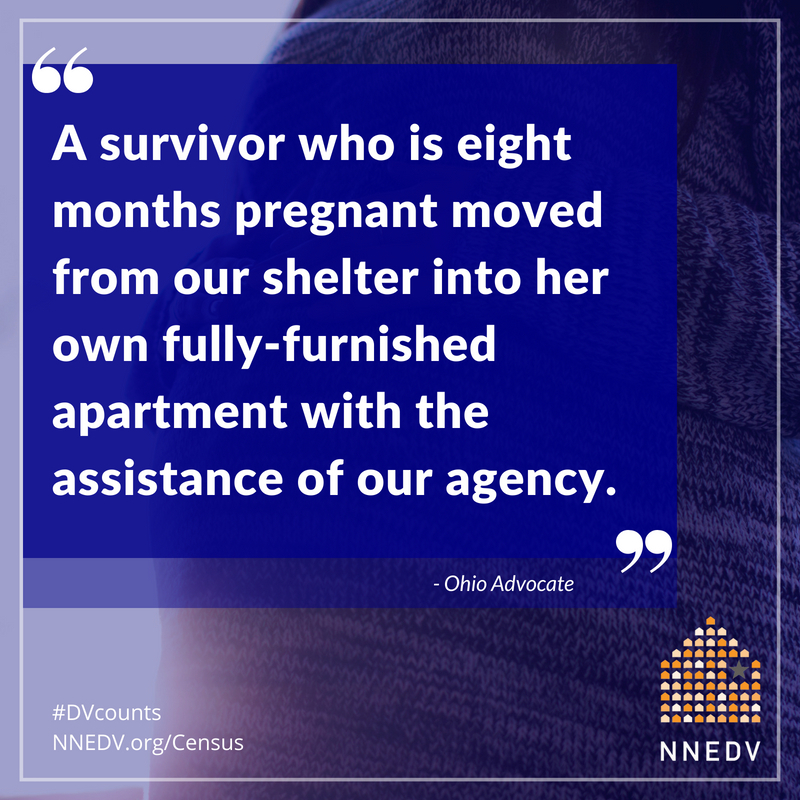 Shelters often suffer damage and lose daily supplies needed to house survivors. 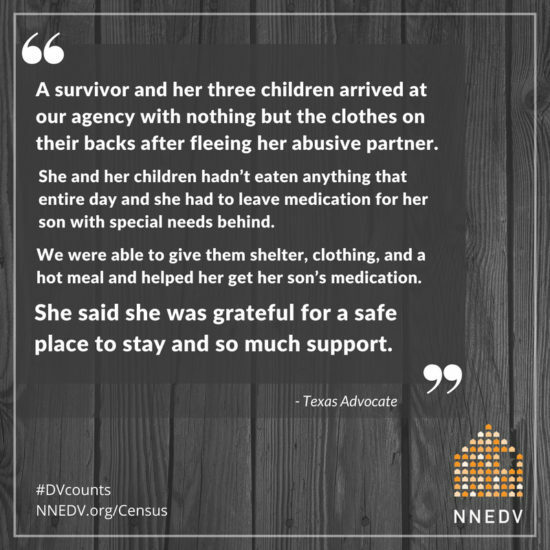 Survivors who have lost belongings turn to shelter as their only resource for food, clothing, and other necessities. A domestic violence advocate is a person who works toward social change and has been trained to support victims of domestic violence. 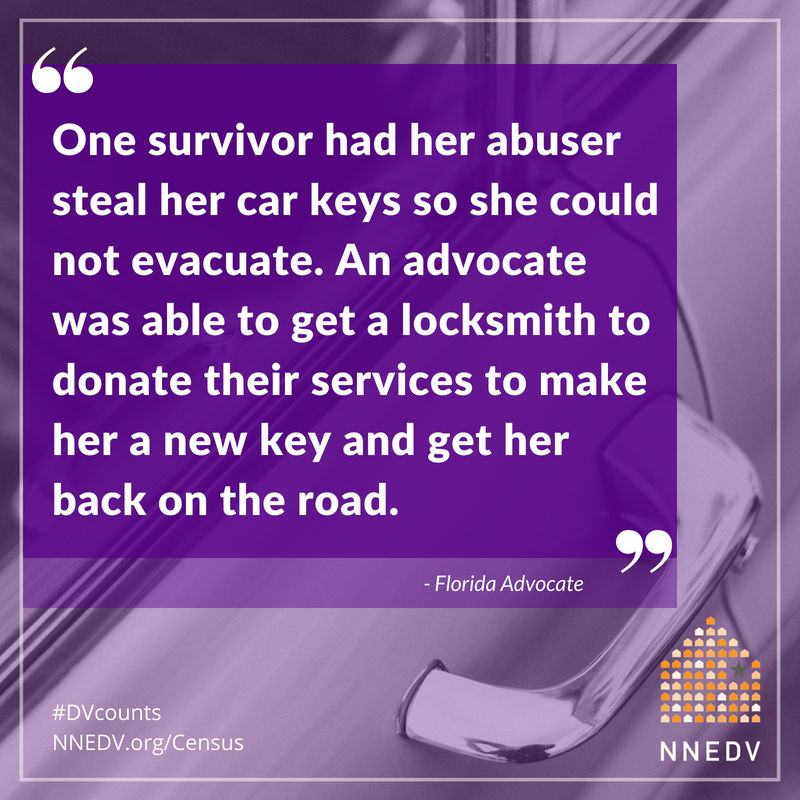 Advocates provide victims with information, referrals to resources, emotional support, and more. 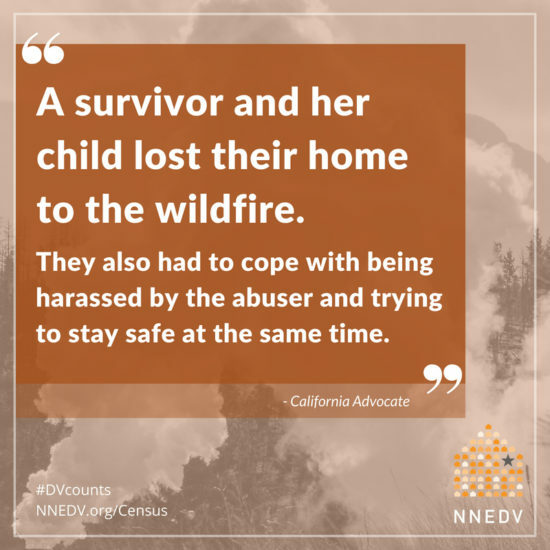 In the aftermath of a natural disaster, survivors face unique safety challenges and rely on advocates and domestic violence programs to help them meet those needs. In 2017, 1,077 staff positions were laid off or went unfilled nationwide. 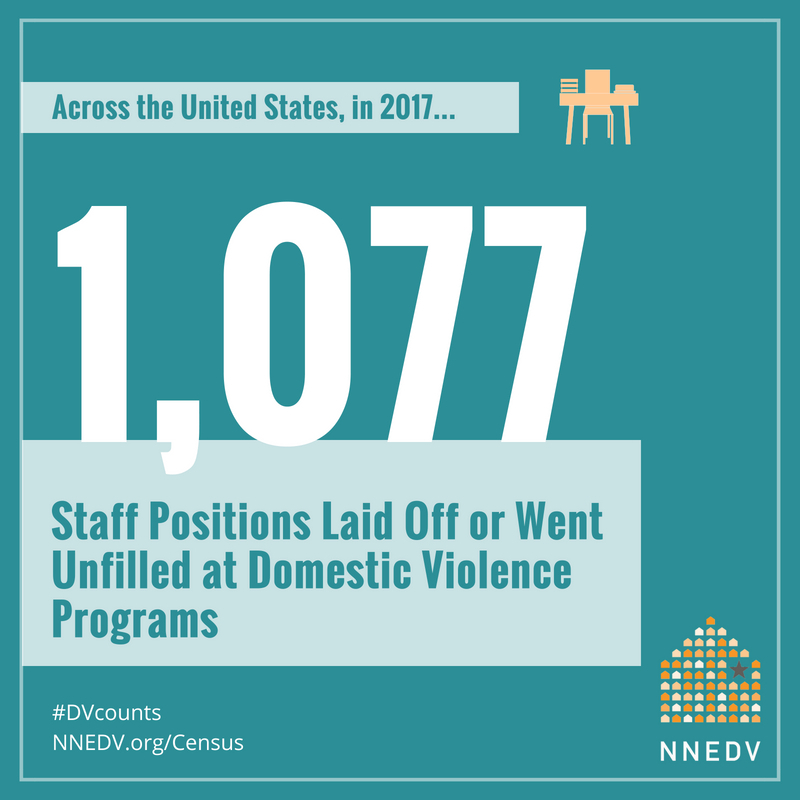 More than 60% of these positions were direct service providers, such as shelter staff or legal advocates. This means that there were fewer advocates to answer calls for help or provide needed services. A survivor-centered approach places top priority on the rights, needs, and wishes of the survivor. 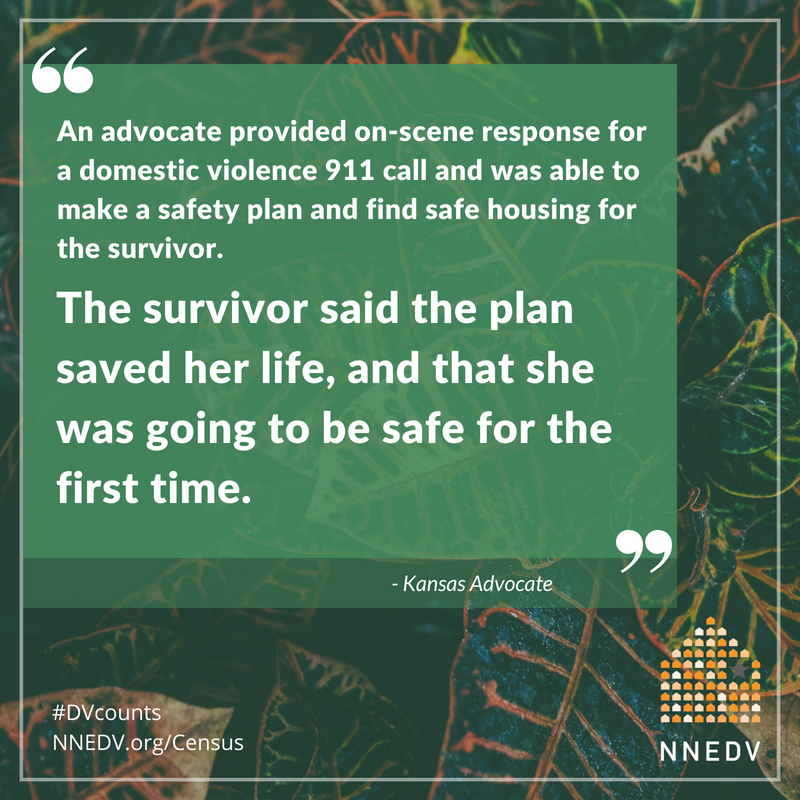 A survivor-centered safety plan is developed in partnership with a domestic violence advocate and focuses on strategies for staying safe. In creating a safety plan, advocates work one-on-one with a survivor to discuss their unique needs and circumstances. Domestic violence hotlines are a lifeline for victims in danger, providing support, information, safety planning, and resources. 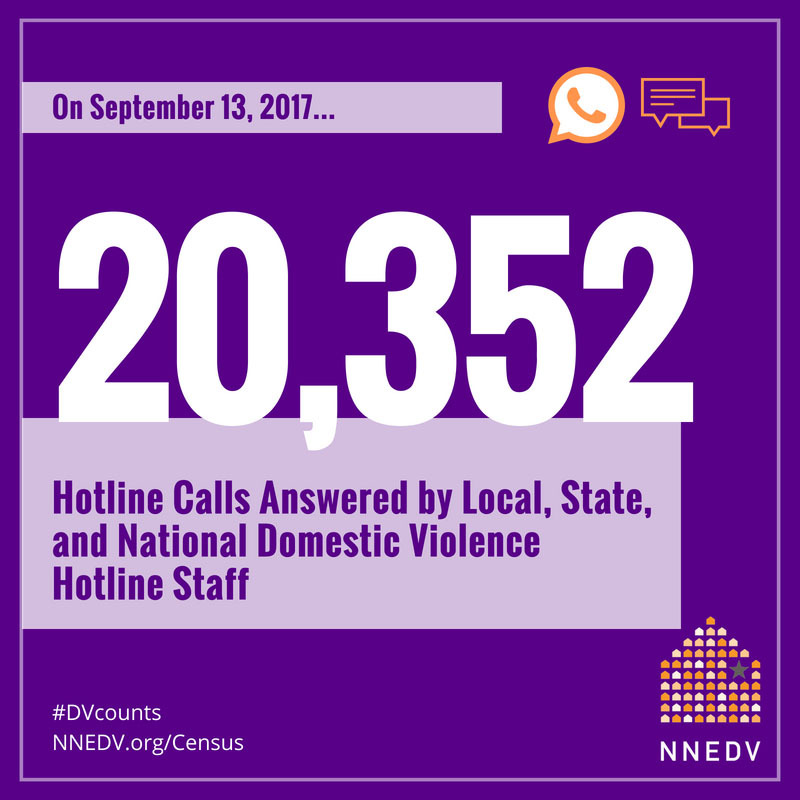 In one 24-hour period, local and state hotline staff answered 19,147 calls and National Domestic Violence Hotline staff answered 2,205 calls. This averages 848 calls per hour or more than 14 calls every minute. 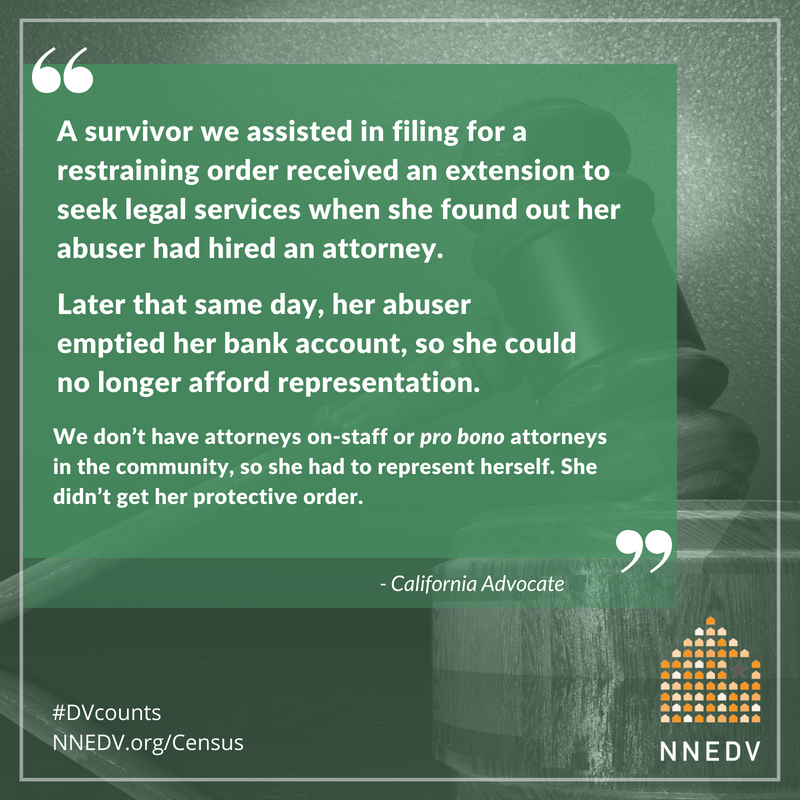 Survivors must often face their abuser in court to obtain a protection order, gain child support, or testify in criminal proceedings. Survivors are frequently further victimized and endangered by the financial and emotional drain of legal processes and outcomes, particularly when they don’t have proper legal representation. Access to legal services, such as a legal advocate or lawyer, can significantly impact safety and long-term stability. Abusers may harm pets in order to hurt victims, to gain power and control, and to intimidate or coerce victims to stay. 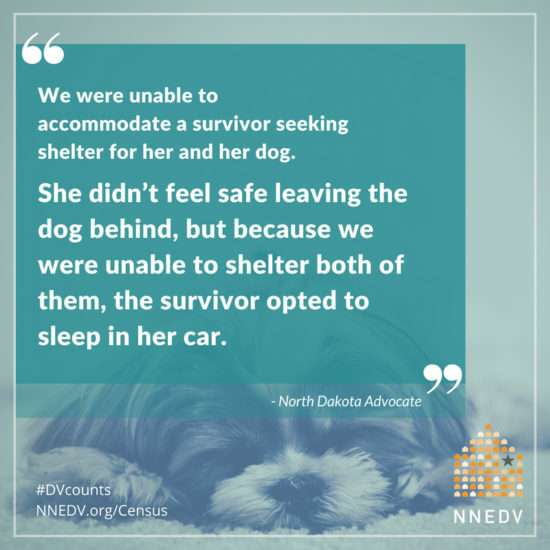 In many cases, perpetrators of domestic violence may kill, harm, or threaten pets in order to assert their dominance and “emotionally blackmail” victims into complying with and remaining silent about the abuse victims are experiencing. In the aftermath of abuse, survivors benefit from compassion and support as they begin to heal and rebuild their lives. 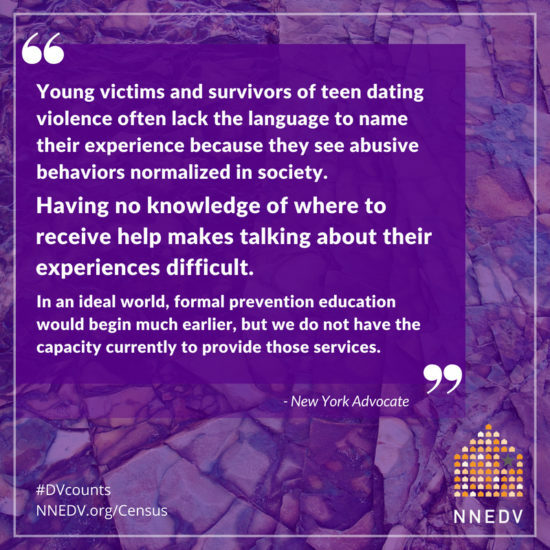 With every interaction, advocates help survivors feel heard, valued, and connected. 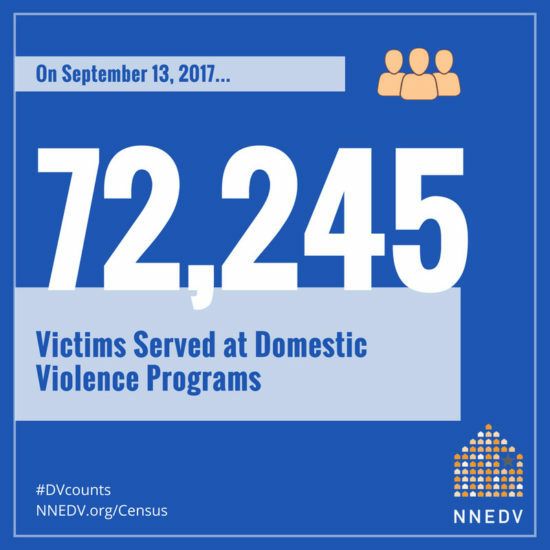 Domestic violence programs provide such services as children’s support or advocacy, transportation, court accompaniment/legal advocacy, prevention or education programs, therapy/counseling, job training, and more. Learn more about domestic violence from our Domestic Violence Counts Census, including state-specific statistics and information.